The Community Development and Knowledge Management for the Satoyama Initiative Programme (COMDEKS) was launched in 2011 to support local community activities that maintain and rebuild target production landscapes and seascapes, and to collect and disseminate knowledge and experiences from successful on-the-ground actions so that, if feasible, they can be adapted by other communities throughout the world to their specific conditions. The programme provides small-scale finance to local community organizations in developing countries to support sound biodiversity and ecosystem management as well as to develop or strengthen sustainable livelihood activities planned and executed by community members themselves. The target landscape for COMDEKS activities in Ecuador is located in the Napo River watershed between the provinces of Napo, Orellana, and Pastaza. 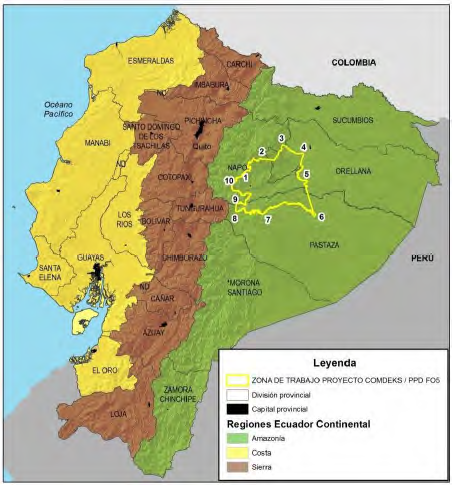 The target landscape for COMDEKS activities in Ecuador is located in the Napo River watershed between the provinces of Napo, Orellana, and Pastaza (Figure E-1). The Napo River is a tributary of the Amazon located on the western slope of the Andes Mountains and flowing through one of the most biodiverse areas of the Amazon Basin. Ecuador Amazon’s rainforest covers 30 percent of the country’s total land area, making it the country’s largest biogeographical region and one that has been characterized as “mega-diverse.” The Napo runs parallel to the Northern border of the 2.4 million-acre Yasuni National Park, Ecuador’s largest protected tract of rainforest and a UNESCO Biosphere Reserve. The target landscape itself is 4,840 km2, with a population of 44,250. The reason for the ecological uniqueness of the selected landscape comes from the fact that during the last Ice Age, the Napo River Canyon acted as a “Pleistocene refuge” for a wide variety of species whose continued diversification has been unimpeded. The Amazon region plays a critical role in regulating the climate as it retains large amounts of organic carbon and contributes to the regulation of the Amazon basin, one of the most important freshwater systems on the planet. Within the waters of the Amazon Basin there are over 1,000 species of fish (including electric eels and piranhas), as well as more than 400 species of amphibians and reptiles. The most notable mammals living in this environment include freshwater dolphins and manatees. The target landscape is a zone rich in biodiversity and ecosystem services. Its inhabitants retain many traditional methods for sustainable resource management and ancestral knowledge of biodiversity. However, it is also an area that has lost nearly 20 percent of its natural vegetative cover in the past 50 years. The main trigger for this has been the rise of resource-extractive industries, particularly the oil and mining industries, which were promoted without taking into account their negative impact on the environment. Since the 1970s, when the oil industry first entered the area, the landscape has become fragmented. The construction of oil-related settlements and infrastructure; the clearance of forest areas for palm oil and soybean plantations, and the use of other unsustainable agricultural practices; the extraction of timber and mining of gold; and also the desire of settlers and local people to own land have all contributed to this fragmentation and environmental decline. Destruction of the area’s ecosystems directly affects the rural communities, which base their livelihoods on local natural resources. This ecological disruption also changes the cultural dynamics of transmitting traditional environmental knowledge to new generations. In spite of these negative trends, one positive factor in the target landscape is that, while the majority of local land is now under private ownership, the land in most indigenous communities still remains under communal tenure—that is, held as common property among community members. This ensures that important conservation areas are not fragmented in indigenous territories, due to the cultural practice of preserving sacred sites and protecting lands for future generations. The socioeconomic context of the COMDEKS target landscape is characterized by indigenous rural communities—mostly Kichwa communities—with high rates of poverty, social exclusion and discrimination. Most of the population living in the rural sector derives its income from activities related to agriculture, livestock, forestry, fishing and tourism, according to the 2010 Census. The mestizo settler population, which makes up about 20 percent of the population in the target landscape, is also engaged in agriculture and logging, as well as more urban services as are found in parish and county seats. Many communities are dispersed throughout the landscape. There are 85 communities in the Yaku Samay area, mainly Kichwa, spread throughout the rural parishes of Archidona, Tena and Arosemena Tola cantons. In the Akllak Sacha area there are 26 communities located in the rural parishes of Santa Clara, San Jose and Arajuno. These communities, which are populated mostly by indigenous people, are organized and represented by community associations—grassroots organizations that are legally empowered to represent the community’s political, social, and commercial interests. An important element of the landscape is that the communities that have evolved amid the rich local ecosystems have developed a culture rooted in the understanding, appreciation, and respect of the land. This has generated forms of ownership and land management that have not only contributed to conserve the forest, but have also created a great deal of knowledge about the potential of its biodiversity, this being the key to the survival of these communities. One of the unique forms of agricultural production and subsistence economy that have arisen from indigenous knowledge of the landscape is known as the “Kichwa chakra system,” in which a biodiverse mixture of local crops are grown together, including coffee, corn, naranjilla, pineapple, beans, cassava, rice and wild varieties of peanuts. Although today this system has been supplanted to a great extent by less diverse and less sustainable farm practices, it remains a viable, biodiversity-friendly economic strategy and has become one of the focuses of COMDEKS livelihood support in the target landscape. Decreasing soil fertility. Threats to soil fertility come from livestock and agriculture—activities that have not taken into account the fragility of local ecosystems. Although the Amazon may seem a fertile land due to its vast forests, what is not generally known is that the forest is sustained by its own decomposition, so that all crop and livestock farming is detrimental over the medium to long term. This creates a vicious cycle where unsuitable practices, such as the decrease in crop rotation, the conversion from intercropping to monocultures, or cultivation of fragile soils, deplete the nutrients that were originally sourced from the decomposition of the forest’s organic matter. This makes the soil increasingly less fertile and results in a continual search for more areas to cultivate. Logging is a common economic activity carried out by locals because other income sources are limited. Forest areas in the Amazon Region are vast and capacities to control and reduce illegal logging are insufficient, despite the current efforts to avoid deforestation. River contamination is a serious problem in the cantons of Arajuno and Curaray. The Arajuno River is located in the center of an oil development block. Additionally, mining activities pollute rivers due to the chemicals used to separate the gold and then discharged into the river, making the water unusable for local communities without affecting their health. Low crop diversity. Local crop diversity has dropped as communities have been influenced by central government policies encouraging monoculture systems and the use of agrochemicals. Unfortunately, these monoculture crops are inherently susceptible to insects and plant pathogens and therefore biologically unstable unless considerable effort is expended to keep out pests and weeds. Environmental threats from infrastructure construction. By law, some of the oil revenues generated in the target landscape are returned to the area to support local infrastructure development. While some of this has been useful, some has been spent on roads and other facilities that have further threatened the environmental integrity of the area through noise and pollution, as well as invasion of the ancestral lands of indigenous communities. Lack of technical and financial resources. Communities lack the information, knowledge and skills to design, implement, monitor and evaluate development projects for effective learning and adaptive management. For instance, monitoring the restoration of native fish populations (one of the COMDEKS project activities) in the rivers is a technical challenge for communities. Lack of support provided by government entities makes it difficult to carry out project activities. During the project planning phase, co-financing support from local governments was agreed and allocated; nevertheless, during project implementation, most of this co-financing was not delivered. Lack of innovative marketing strategies for selling the local products from the “chakra system”—products that, if marketed correctly, would provide a sustainable alternative income source. For such value-added products, proper planning for sales and branding is necessary to make them competitive in local and national markets. Migration and labor shortages. The scarcity of income opportunities in rural communities gives rise to significant out-migration, particularly among young adults who leave the local farms to seek employment in towns and cities. Aside from the social disruption this causes in rural communities, it also causes local labor shortages, which can affect the ability to meet community goals and achieve sustainable development. Loss of traditional knowledge. There is a need for restoration of local knowledge regarding health, use of medicinal plants, agriculture, local cuisine and traditions, as there has been a considerable decline in interest by new generations. Cultural differences among communities. Every community has its own set of beliefs and practices, and gaining acceptance from communities for outside ideas and practices is a gradual process. This can make sharing traditional knowledge among communities and offering locally tailored training a challenge, and can potentially slow down landscape-wide activities. To engage communities in the target landscape and understand the current landscape conditions, a Baseline Assessment was conducted in 2013, led by the Sacha Causai Foundation. The assessment involved meetings with local community leaders, site visits to preselected areas in the target landscape and workshops for the participatory selection and design of projects. A community consultation was conducted based on the COMDEKS questionnaire and Resilience Indicators of socio-ecological production landscapes (SEPLS), gathering information from men and women from local communities. A Kichwa translator facilitated the consultation to ensure full engagement of community members. In undertaking the Baseline Assessment and Community Consultation, COMDEKS Ecuador built upon a considerable foundation of work accomplished earlier through the SGP grants in support of Ecuador’s “Biocorridors for Good Living” program. This work included mapping, ecological analyses, and community organizing around the Biocorridors program. Results of the baseline assessment provided the basis for the development of the COMDEKS Landscape Strategy in the Ecuadorian Amazon Region, aiming to guide local communities in the development of community-based projects, as well as conduct project monitoring, thereby enhancing resilience of the target landscape. The goal of COMDEKS activities in the area is to consolidate, replicate, and scale up the work already under way by indigenous and rural community organizations to protect the biodiversity and culture of the areas surrounding the Napo River. The landscape approach supported by COMDEKS in Ecuador builds upon the concept of “Biocorridors for Good Living” (Buen Vivir or Sumak Kawsay), a concept adapted from the 2008 Constitution of Ecuador and the National Plan for Good Living, and implemented earlier by the Ecuador GEF Small Grants Programme (SGP), with the aim to support local initiatives focused on promoting biodiversity conservation throughout Ecuador’s various ecosystems. “Biocorridors for Good Living” are described as expanses of land where ecological connectivity is reestablished, connecting fragmented habitats, incorporating sustainable production activities into the landscape, and fostering community partnerships. The GEF SGP Ecuador Country Programme supports four priority ecosystems: paramos (Neotropical high mountain biomes), dry forests, mangroves, and tropical forests). The Amazon Region, where the COMDEKS target area is located, is one of the four priority ecosystems supported by the GEF SGP Ecuador Country Programme. It is an area with particularly relevant ecosystems, which belong to indigenous and rural communities engaged in productive activities and which are under pressure from large-scale resource extraction activities. The COMDEKS approach is interrelated with the approach and strategies used by the SGP Ecuador Country Programme to build the Kamanwi, Yaku Samay and Akllak Sacha Biocorridors —a participatory process in which many local actors cooperated. Figure E-2 shows the operational-level linkages, ensuring that COMDEKS and SGP act in a common conceptual and operational platform. Stakeholders in the COMDEKS target landscape crafted their Landscape Strategy with the intention of building on the achievements and lessons of the SGP Ecuador Country Programme and its work on Biocorridors for Good Living. Table E-1 lists the three Landscape Outcomes around which the Ecuador Landscape Strategy is built, as well as performance indicators that will be used to measure these outcomes. Greater ecological connectivity and improved biodiversity through reforestation activities and protection of watersheds. Number of communities with agroecological farms. Number of plants planted, by species. Number of forest species recovered. Number of water sources protected. Sustainable production landscapes: Improved local livelihoods through the development of sustainable enterprises. Number of community tourism companies operating. Number of rural women producing artisan crafts. · Number of communities which offer bird- watching tourism services. · Number of chakras with agroecological improvements. · Number of quintals of locally produced cocoa in the value chain. · Number of families engaged in fish farming using local fish species. Strengthened institutional capacity and participatory decision making through the promotion of community working groups and conservation agreements at the landscape level. Number of Biocorridor Working Groups and Regional Working Groups established. Number of certified regulations for community organizations. Number of community incentive proposals developed. 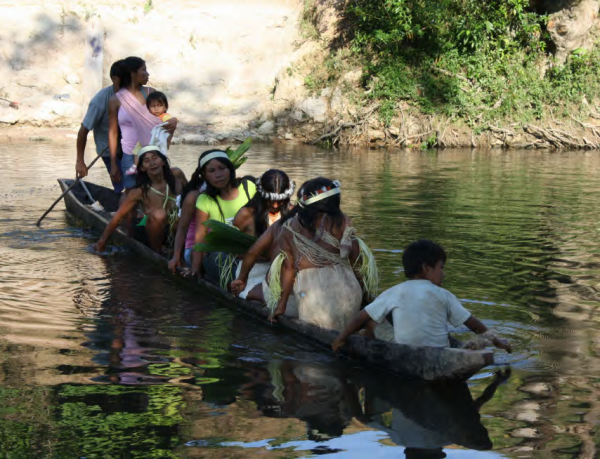 To guide the selection of local projects aimed at contributing to community and landscape resilience, the Landscape Strategy for the Napo River Watershed suggests a number of activities that together would contribute to the Strategy’s specified Resilience Outcomes. Protect and restore local watersheds. Promote and strengthen capacities for fish farming using native fish species. Develop proposals for incentives for environmental services in significant areas of the target landscape. Five proposed projects in the biocorridors Yaku Samay and Akllak Sacha were identified during the consultation process to be funded through COMDEKS. In keeping with the suggested activities above, the five COMDEKS projects support agroecological and agroforestry practices to diversify household production, conserve important forest ecosystems through reforestation activities and protection of micro watersheds, and promote income generation activities such as the development of sustainable tourism and farming of native fish. These COMDEKS projects are expected to generate important lessons about best community practices in order to maintain, rebuild, and revitalize landscapes. As part of the process of community empowerment, and in order to encourage effective partners to participate in the project work, several federations of local peoples were organized before project work commenced. These federations included: Kijus Association of Kichwa Communities (known as ACOKI); Cotundo Union of Kichwa communities (UNCOKIC); and the Kichwa organizations of Loreto (OKIL), which includes the associations CONAKINO, FAOICIN, and FOCIN. US$39,254 Outcomes 1, 2, 3 Conserve tropical forest margins in the Great Anzu River area, and create a community reserve. Design and manage municipal practices and legal regulations for local natural resource management. Promote local products made from non-timber forest resources to create local employment. Promote the empowerment of communities through partnership for the conservation and sustainable use of natural resources, creating strategic alliances with universities, for example. US$45,874 Outcomes 1, 2, 3 Conserve and manage natural resources of the rainforest and watershed communities formed by the association of AMA and AMKACE, a purpose that goes hand in hand with the strengthening of the cultural identity of the Kichwa Nationality in Arajuno and Curaray. Restore the forest and watershed through reforestation. Increase the production of cocoa through an agroforestry system under the local chakra system or in combination with the cultivation of cassava, plantain, corn, and other forest products used for making crafts. US$50,000 Outcomes 1, 2, 3 Promote sustainable livelihoods, such as small-scale farming in agroecological chakras, fish farming, and establishing wayusa plantations. Establish financial incentives for local conservation through “Socio Bosque,” a payment for ecosystem services (PES) program run by the Ministry of Environment in which authorities provide a small payment for each hectare of forest that is conserved. US$50,000 Outcomes 1, 2, 3 Promote equality, social and territorial cohesion, and integration within the Yaku Samay biocorridor community. The project seeks to conserve the banks of the Rumi Jicama and Puni rivers, located in the watershed of the river Calmitoyacu. It also seeks to strengthen the management processes of the ancient chakra in the communities of Santa Rita, Wambula and Manduro Yacu by strengthening the capacities of local women’s organizations. Reforestation with native species in the area will also be prioritized. US$50,000 Outcomes 1, 2, 3 Contribute to the conservation of biocorridor Akllak Sacha through conserving natural resources, and improving the quality of locally grown cocoa, thereby contributing to increased incomes of cocoa producers. In collaboration with partner communities, the Fine Aroma Cocoa Producers Association will contribute to the conservation of the Llanganates buffer zone of the National Park and conduct reforestation activities. Negotiating community conservation agreements and preserving communal land tenure: COMDEKS projects have resulted in the negotiation of four community conservation agreements involving 7 different communities and some 96 families. These voluntary agreements, which commit communities to preserve the local forest in an undeveloped state, have resulted in the conservation of 577 ha of tropical rainforest. These agreements are particularly important because they insure that the land in the indigenous communities involved will remain as communal property, rather than be converted to private property. This ensures that important conservation areas are not fragmented in indigenous territories and encourages the traditional practice of preserving sacred sites and protecting lands for future generations, ensuring community participation to achieve a common goal. COMDEKS has been particularly effective in helping to bring about these community conservation agreements. Out of the 12 community conservation agreements signed in the Ecuadorian Amazon territory, four came from COMDEKS projects. This is a significant achievement, because community organizations first had to lead a process of community sensitization and socialization about the importance of preserving landscapes and reforesting degraded sites. Finally, they achieved ratification of these community agreements during an assembly of community delegations. 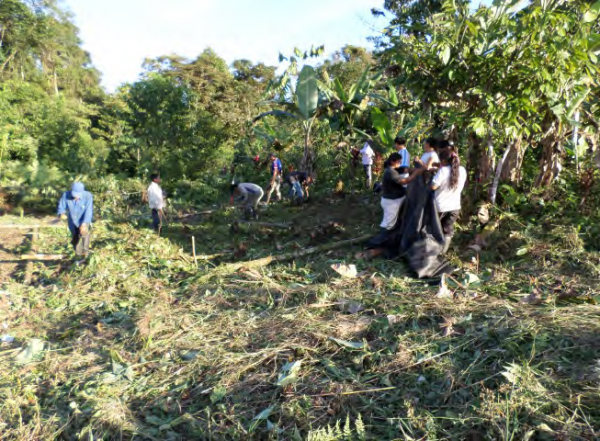 Restoring degraded forests and conserving watersheds: Communities reforested 34 ha of degraded forest using native tree species. They also carried out conservation activities in seven microwatersheds. The communities of Arajuno and Curaray also developed and implemented a management plan for the local watershed. Reviving and enhancing the “Kichwa chakra system”: COMDEKS Ecuador has made the revival and expansion of the use of the traditional “Kichwa chakra system” a central theme in its work to encourage sustainable agriculture and improve local food security. This traditional planting system, in which a family cultivates an array of different crops in a single field, had been largely displaced in many communities by less sustainable single-crop systems. In the chakras, which are mainly the domain of indigenous women, short-cycle crops such as corn, peanuts, naranjilla, yucca and rice are grown together. Perennial crops such as coffee, cocoa and bananas are grown in terraces from 440-1,250 m elevation. These are the most important crops because they generate income for growers; these varieties are grown in all seasons and there are seasonal harvests, which are sold on the local market. Banana and yucca are also used for family consumption and maize is used as poultry feed. Reviving and expanding this chakra system has resulted in restoration of local knowledge, income generation for local people and conservation of the tropical forest. Through COMDEKS projects, the area under the chakra system was expanded by 152 ha, involving 226 families from 26 communities. Most of the additional production in these expanded chakras is used for local consumption, in order to enhance food security. 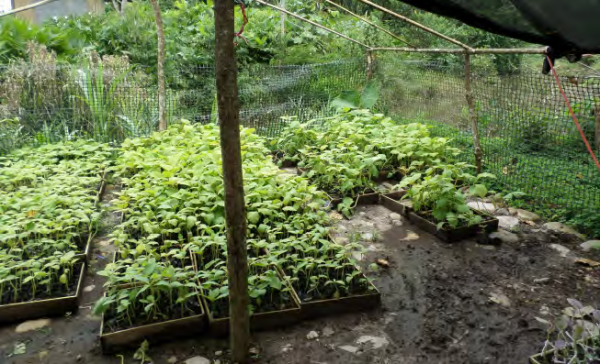 Promoting sustainable fish farming, organic cocoa cultivation, and other livelihood alternatives: Under four different COMDEKS projects, sustainable fish-farming was established in the target landscape with the participation of 127 families in 26 communities. Previous fish-farming methods in the area had involved planting tilapia—a non-indigenous fish—directly in the rivers in netted sections, a practice highly damaging to native fish species. 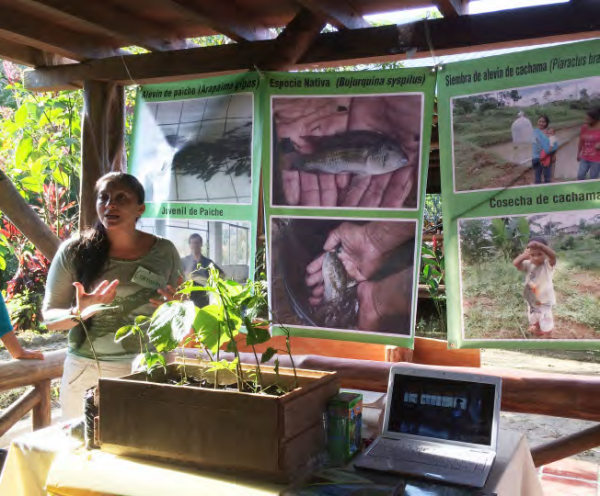 The fish farming promoted through COMDEKS uses cachama (Piaractus brachypomun), a native fish, raised in 98 fish rearing ponds constructed around the region, rather than in the river. Harvested fish are sold at local markets for income. Cultivation and marketing of a locally adapted organic cacao (called fine aroma cocoa) that is grown in the chakra system is another alternative source of income promoted through COMDEKS. Technical and marketing assistance and equipment provided to the Fine Aroma Cocoa Producers Association of Carlos Julio Arosemena Tola has been invaluable in the effort to market this local cocoa as a specialty product with added value. Yet another alternative income source promoted through COMDEKS has been cultivation of guayusa, whose caffeinated leaves are used to make a stimulant tea. Creating financial incentives for forest protection: Recognizing the benefits of COMDEKS initiatives, the Ministry of the Environment in Ecuador, through the “Socio Bosque” project, has successfully implemented a forest protection program in the community of Santa Rita, located in the Yaku Samay biocorridor. Through the Socio Bosque program, the Ministry of the Environment (MAE) enters into conservation agreements with landholders, in which landholders receive a small PES (payment for ecosystem services) payment in exchange for protecting local forest cover. The purpose of the project is to create a system linking incomes to environmental services, creating an alternative to unsustainable exploitation of forest resources for livelihoods. Entering a partnership with Colonso Chalupas Ecological Reserve: In 2014, as COMDEKS projects were underway, the Ministry of the Environment designated a new protected area in the target landscape called Colonso Chalupas Ecological Reserve. In response, the Association Pashimbi, representing communities near the Reserve, drafted a management plan that ensures the preservation of the buffer zone of the new Ecological Reserve. This was done as a way to avoid conflicts, share information with the Reserve about local people, and to become an active rather than passive partner with the Reserve. This management plan now positions the community as one of the key partners for the Ministry of Environment, demonstrating the project’s political impact in the target landscape. Encouraging CBO networks to maximize impacts: Cooperative work on the biocorridors in the target landscape has brought benefits beyond improving landscape connectivity. It has also shown local community organizations the benefits of joining together in partnerships and networks with the aim of maximizing their impact on environmental management, economic development and participation in policy-making using a collaborative approach. COMDEKS projects in the Napo River watershed empower communities to conserve important ecosystems through community agreements, forest restoration and protection of microwatersheds. Communities contribute to strengthening the sustainability of production systems through agroecological and agroforestry practices in so-called “Kichwa chakra systems,” farming of native fish, and development of products with a local identity such as cocoa and guayusa, which also generate family income. Resilience in socio-ecological production landscapes in the Napo watershed is evident when communities disseminate ancestral knowledge—such as the chakra system—and strengthen their capacities to implement sustainable activities through local associations and federations that link producers across the landscape. As a foundation for these achievements, COMDEKS Ecuador benefited from its close association with the SGP-supported Biocorridors for Good Living program, which was based on a landscape approach and was entirely consistent with COMDEKS principles and landscape planning practices. 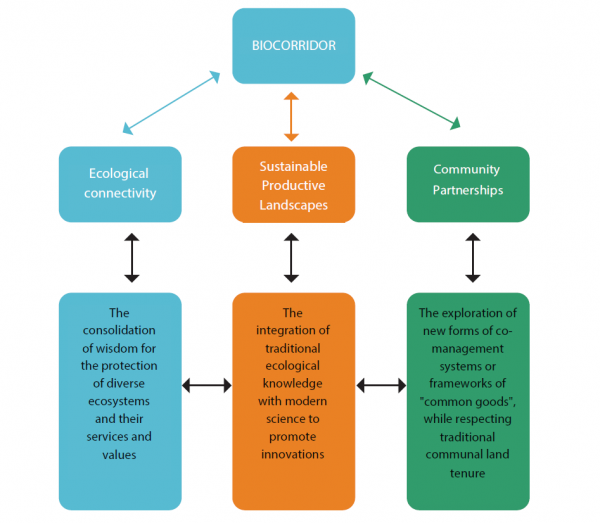 Much community organizing for the Biocorridors had already been accomplished at the outset of COMDEKS, and the ideas of landscape connectivity, sustainable production landscapes, and community partnerships—the three elements that define the Biocorridors for Good Living approach and also underpin the COMDEKS landscape approach—had already been introduced to many communities in the target landscape. In addition, local and national government actors were supportive of the Biocorridors and of the COMDEKS approach. One of the practical effects of the area’s history with the Biocorridors program is that stakeholders were accustomed to meeting together in multistakeholder and multicommunity groups for the purpose of landscape-level governance and project planning. In fact, a Biocorridor Working Group had already been established for the two biocorridors in the target landscape, and the participants in COMDEKS projects attended these meetings as well. The net effect of these factors is that the maturation of a landscape community in the Napo River watershed is already well underway, although sustaining this community once COMDEKS projects are complete will require continued effort from all parties. Community conservation agreements in the Napo watershed are powerful tools that demonstrate the commitment to conserve ecosystems in the target landscape. During the process of forging these agreements it was essential to raise awareness of the importance of ecosystems and to define management plans for the use of lands among community members. After projects are finished, it will be necessary to constantly monitor the implementation of these agreements. Local knowledge dissemination was highly important to increase ecological resilience in this landscape. This dissemination was necessary to revive and spread the Kichwa chakra practices, which help to maintain and enrich local biodiversity. However, now there is a need to create a marketing strategy for chakra products in and around the biocorridor, and to support the creation of a brand identity around these local products. The value of local biodiversity products can be increased with simple processes and low-cost technology; for instance, chocolate can be produced from locally grown “fine aroma” cocoa without major investments. Products with “local identity” were developed to reinforce local production and generate additional family income. Fish farming with native fish species represents an innovative and important sustainable practice in this region. This activity challenged communities because technical methods were required. But the result was greater food security for communities without disrupting river ecology. Participation and agreements among communities, local governments, NGOs, universities and other relevant local stakeholders can be an important platform for the achievement of conservation goals as well as community empowerment, as demonstrated by the management plan developed by Pashimbi Association for the community lands in the buffer zone of the newly created Colonso Chalupas Ecological Reserve. The agreement showed that flexibilty and responsiveness by communities to new land use challenges can allow communities to be players in local landscape governance and help them protect their community interests. Local knowledge and practices are being lost over generations. Nevertheless, it is possible to link men, women, young and elders to sustainable activities that can maintain cultural and generational manifestations. COMDEKS activities were able to encourage communities to value their land, their language and their ancestral practices. The revitalization of the chakra system was perhaps the best example of how ancestral knowledge can play an important role in addressing modern development challenges in the Amazon Basin. “It is essential that in these places, where people are living and working, where they have their chakras; biocorridors consolidate and remain over the long term, because these are locations for species connectivity, seed transfer, and especially for ancestral knowledge maintenance.” Rocío Paz y Miño, Pashimbi Association. “COMDEKS projects are reflected in this territory when people work together, when they recover or become aware of their ancestral knowledge”, Rocío Paz y Miño, Pashimbi Association. “We work in the jungle and we imitate jungle when we diversify products in the chakra. For me, this factor improves sociocultural and productive aspects in families from the Amazon Region. In the chakra we produce species that are valued in markets”, Rodrigo Gonzáles, CEDIME Project.